I was very fortunate to have the opportunity to present a session at ISTE 2017 with my colleague, Gabriel Yanagihara. Our session was titled Changing the (Virtual) Reality of Education. We shared the various VR projects we both conducted during the 2016-2017 school year. Kanoe Namahoe, editor of SmartBrief on EdTech, attended our session and also interviewed us for a great article in their SmartReport on Edtech Back-to-School Issue. Read on for access to the article and a handy downloadable companion infographic! Based on my interview with Kanoe, she came up with 5 tips for developing VR content creators. The topic of VR creation has been a strong passion of mine since I discovered virtual reality a few years ago. I've been feverishly exploring how to help teachers and students create VR content in my own school as well as through conferences and workshops over the past 2 years. Three of my go-to VR creation apps are: Google Street View, Thinglink VR Editor, and CoSpaces EDU. Your one stop resource for all things Virtual Reality in Education! Check out these CoSpaces VR Projects! 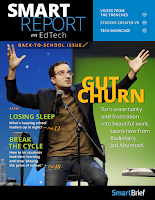 Check out the SmartReport on EdTech Back-to-School Issue! You have to sign up for SmartBrief, but it is an amazing resource for all things EdTech! And check out other articles by Kanoe Namahoe. She does some great reporting! You can also follow SmartBrief Education on Twitter @SBEducation! You can also download a PDF version and print it! Hang it up by your desk for inspiration or in the teacher's lounge! 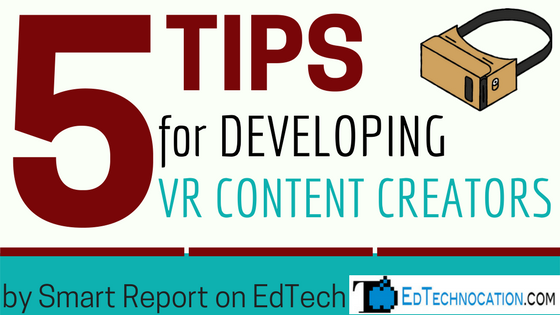 5 Tips for Developing VR Content Creators Infographic by Smart Report by EdTech & EdTechnocation is licensed under a Creative Commons Attribution-NonCommercial-NoDerivatives 4.0 International License. Based on a work at www.edtechnocation.com. Virtual reality may seem like the latest trend in the IT world, but its implications go beyond and extend to so many different sectors. All the big companies including Google, Facebook, and Netflix, the world of gaming and even the Hollywood are investing VR technology.